In this cooperative game 2-5 players try to find cures for different diseases that break out around the world. It's up to the players to save the world - and use the special abilities of the characters as efficiently as possible to stop the pandemic. The board shows the whole world, including the most important cities on each continent. Each player controls little wooden figures - also a lot of cards and some cardboard markers are used to play. Nicely done - not only what concerns graphics and design, but the quality as well. Each player is dealt a profession card at the beginning, which allows him to perform some special actions according to his role (dispatcher, scientiest, researcher,...). All players start in Atlanta, where the first research station has been placed. 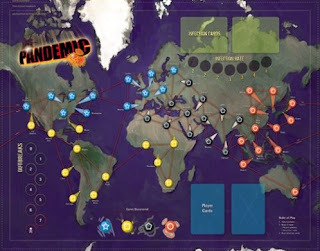 In each turn every player is allowed to perform four actions (move to another city, treat a disease,...), afterwards he draws two cards and finally he has to play the infector - which means that the infections will be spread further around the world. In close cooperation all the players have to move between the cities and try to dam up the infections until enough specific cards have been collected to find a cure for the four different diseases. Pandemic is a cooperative game - and from my point of view it is one of the best cooperative games available. It has great and very original mechanics, additionally it's also possible to increase the difficulty level steadily - which makes every new game challenging. It is fun with two players, as well as with three or four - and I'm definitely looking forward to the planned expansion "Pandemic: On the Brink", which is expected to be released in Summer 2009. From the publisher: Four diseases have broken out in the world and it is up to a team of specialists in various fields to find cures for these diseases before mankind is wiped out. Players must work together, playing to their characters' strengths and planning their strategy of eradication before the diseases overwhelm the world with ever-increasing outbreaks. For example, the Operation Specialist can build research stations, which are needed to find cures for the diseases. The Scientist needs only 4 cards of a particular disease to cure it instead of the normal 5. But the diseases are outbreaking fast and time is running out: the team must try to stem the tide of infection in diseased areas while also towards cures. 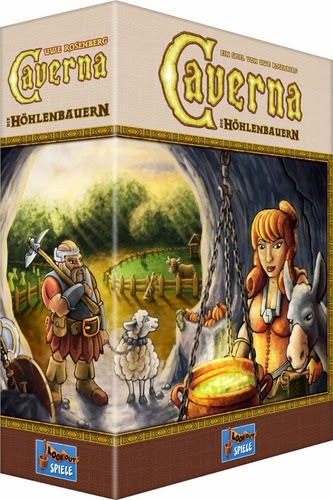 A truly cooperative game where you all win or you all lose. 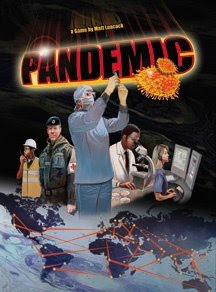 rules for "pandemic" can be found here!